One minute forty-nine seconds of JK Rowling interspersed with beautiful (if slightly bobo) animation leave us with more questions than answers. The highly-anticipated Pottermore website will be an interactive reading experience, with readers' contributions feeding into the original stories. Jo promises a 'safe' platform, full of extra details probably drawn from her many notebooks of background and biographical information. For the moment, what we know from the Leaky Cauldron, one of the most famous fansites in the Pottersphere, is that we'll learn more about Professor McGonagall's and the Dursleys' backstories; that we'll be sorted into houses; and that we'll get a 'unique' wand. Many more 'official leaks' can no doubt be expected in the near future. How will this interactive world unfold? We can be sure that the academic and publishing world will be watching extremely carefully. Too close to a video game, and it will betray the nature of literature, the dwindling of which everyone already deplores; too close to a Choose-Your-Own-Adventure story and we'll feel like we're back in the nineties. The designers will need to work their way cautiously between these two pitfalls. 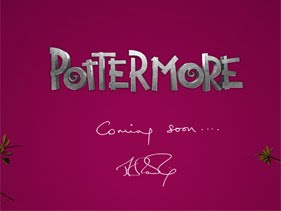 Of course Pottermore will also be a platform for selling ebooks and, potentially, more derived Harry Potter products. Are we heading towards a new publishing trend where the gap between paper books and their e-twins will need to be bridged by imaginative marketing strategies, enlarging the reading experience to a tree of endless real and virtual ramifications? Straddling Twitter, Facebook and YouTube, the creative minds behind Pottermore are clearly tech-savvy and ready to embrace viral paths to success. With Pottermore we can expect more definitional issues for academics. 'Reading', 'literature', 'books', 'narrative', 'reader' - what becomes of these signifiers when they come to encapsulate such a wide variety of signifieds? With one foot on pulped wood and the other one in the binary void, literature is still groping around for balance. In this precarious equilibrium, publishers, authors, agents, and academics find themselves in challenging times. Pottermore is more than Potter: it is a glimpse of the future.